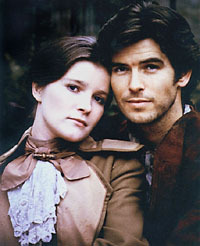 Back in 1981, before Pierce Brosnan became Remington Steele (and before Kate Mulgrew ever dreamed she would one day be Voyager's Capt. Katherine Janeway), they starred in a miniseries about two star crossed lovers, Rory O'Manion and Rachel Clement. Spanning twenty years and two continents, it allowed us to see glimmers of the wonderful actor that we all admire so much. If you've never seen this wonderful miniseries, please find it. Amazon has it, you can find the page for it here. And if you happen across the novel (even though it's out of print) The Manions of America by Rosemary Anne Sissons, by all means read it. It helps make sense of the movie. Amazon recently had used copies for sale. Search their data base. Okay, I've said all of that to say this: I've begun a Manions sequel, "Manions of the West". If you haven't seen the mini series or read the book, you might need some background on the story. Disclaimer: I don't own any of the characters from "Manions". These pages and the included story are meant for entertainment purposes only. No copyright infringement intended or implied. I'm not getting any money for this- so please don't sue me.